CRAZY DISCOUNT! Was: $429.95 Now: $289.96! 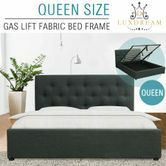 The LUXDREAM Gas Lift Charcoal Linen Bed Frame-Queen creates an sophisticated and modern sleeping space in the bedroom! 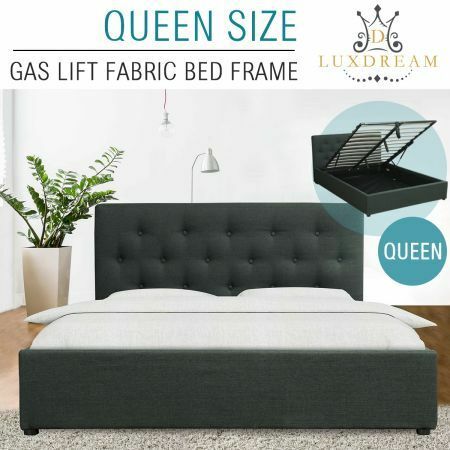 Featuring a chic button-tufted design on the headboard with linen upholstery,a gas lift design for extr storage space and a classic shape of the bed allows it to fit into any bedroom decor. The quality thick padding on the headboard makes it ideal for support while sitting upright while reading, working on a laptop or watching TV. Constructed with heavy duty steel stand bars and a steel centre bar for extra support, it does not require a box spring. Crafted to combine comfort and style, this stunning bed frame provides the elegance and comfort of dreams! Great seller happy with item highly recommend seller. Fantastic for storage and easily pulls upback down. sturdy and durable. sleek and sofisticated look.